We’ve all been there. Got on the train to work, had a quick trawl through twitter and the news sites, and spotted an eminent academic from another Higher Education Institution being quoted in the national news on a subject that one of ours could have been quoted on, be it Diabetes Week, World Food Day, or International Women’s Day. So, how did they get quoted and we didn’t? Chances are, they had a Content (Marketing) Publishing Calendar and had planned the article or quote weeks in advance, timing the content publication just before the event, giving journalists something to use in their articles, and feeding social media channels at the same time. With content creators across large institutions increasing in number, it is more important than ever that content is planned, scheduled, allocated a clear owner, audience-focussed, measured, helps the organization achieve its goals and is delivered on time. Content needs to support the organization’s content marketing goals and so, first, you need a documented Content Marketing Strategy. Organizations need to switch from undertaking short-term campaigns to ongoing publishing. Without a content marketing strategy, your content could be chaotic, irrelevant to the audiences you are trying to reach, have gaps and/or duplication, and have no impact on organizational goals and profitability. And underpinning and organizing that strategy, is a Content (Marketing) Publishing Calendar. At its simplest a publishing calendar is a written list of what is to be published and when. It brings the content strategy to life and always ensures that there is something being written about (in its broadest sense). As an epic list writer (I write lists of lists! ), I can’t think of any other way of working, but for true creatives, the idea of planning and scheduling may be alien to their more fluid ways of working. However, calendars aren’t there to stifle creativity – they are there to give it structure and make sure that there are no gaps or duplications. Think of it as art meets science. I’m currently a Content Team of one, and so my publishing calendar is relatively simple. It starts broad, with four topics at a time over a nine or 10-day period, and then gets developed into a more granular daily schedule, which gets tweaked and refined as the research starts and the articles begin to take shape. Audiences have already been agreed and topics aligned to organizational goals. I start by typing up the broad list with an overview for each article, but I do like a handwritten daily task list that satisfyingly gets ticked off, or not-so satisfyingly moved to the next day! Either way, this planning and organisation ensures that each deadline is met and work is scheduled to make that happen. The Content Marketing Institute have created some free templates along these lines. A few of my daily task lists! However, as your content teams grow, become devolved across an organization, maybe even sites and countries, let alone buildings, something more structured and collaborative is required. Something that can plan and manage your publishing cycle, keep it on track, ensure that it is working for the audience and the organization, and really show the value of a strategic marketing approach to content creation, publication, and distribution. 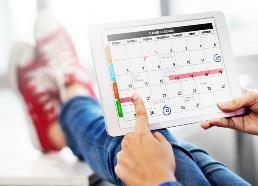 There are loads of different tools that can be used to create a calendar and so some of this will come down to trial and error – which one works best for your organisation given the tools you are allowed to use (e.g. is your organization OK with you using Google tools? ), the skillset of the content creators involved, and, in some cases, budget. Trello and Google Docs/Drive come up time and time again in lists of editorial calendar tools, for example, this one from Written, as does the WordPress Editorial Calendar for those who are largely scheduling blog posts only and work direct in WordPress. Bigger systems such as HubSpot and Coschedule (who are both excellent examples of how to use a content marketing approach well) have scheduling systems within them. HubSpot have also created their own free templates which you can download and have another free download using Google calendar. Whilst Coschedule have blogged about the topic; all great examples of content marketing in action. This useful content drives traffic to their site. Good work! One thing that is for certain, is that one person needs to have clear editorial control over what is published when, and by whom, rather than it being a free for all. Editors have existed across many channels (newspapers, film, TV, radio) for many years and it’s a role that is often misunderstood. In the ‘online’ context, whilst they will almost certainly create content, they are largely responsible for ensuring quality and consistency across digital channels. We have had Web Content Editors for quite some time, but now this role needs to expand out to cover all digital channels, as laid down in the Content Marketing Strategy, and work very closely with any non-digital teams, e.g. print, or even better, have oversight of offline content too. What goes in a Publishing Calendar? Different channels may need different topics, and so it isn’t unusual to have one master ‘tab’ or calendar with broad categories (subject, headline, author/owner, publication date, channel) and then other calendars for the different channels with their own topics listed. So, it’s about looking at your content marketing goals, your team, and your channels, and developing the most appropriate calendar for your organization, usually by starting with a free template and working from there. But where to start with what to publish? There are several ways of quite quickly filling in some of the gaps on the calendar. First of all, there will be activities and events across your institution that happen every year so start with those. Examples include open days, graduations, Freshers’ Week, exams, Clearing and so on. And each one of these broad topics is ripe for useful, informative and institution-neutral content, as well as showcasing how your organization approaches these significant activities in its own way. Another quick-win is local, national or international events that align themselves to your organisation’s mission or experts. This could be one of the UNESCO International Days, Weeks, Years or Decades, a UK bank holiday, an awareness day, or a special event or theme day. Your organization is full of experts in certain fields, so ask them what is important to their peers and profession, and get them to suggest events and activities to schedule content around, or topics for content that they could co-author. Expert-opinion is always valued, but often difficult to get hold of in a reactive way. Having as much content scheduled and planned, and predicted, can enable content authors, and experts to be more reactive when the need arises. A good example would be a senior academic blogging about contemporary events, sharing both a neutral opinion on the situation whilst also showcasing the individual and institutional expertise in that area to prospective students, peers in the field, and the media. LSE has a great example. You also have plenty of content there already, some of it ‘green field’ content that is (with the odd tweak here and there) very useful for a significant amount of time. Re-purpose this content, turn a blog post into a presentation, take some top tips from the presentation and tweet them. That content must have been written for a reason in the first place (!) so see if that reason is still relevant and re-purpose and re-use. And then there is content curation. Do your subject pages have a ‘top ten revision sources for A-level Chemistry’ or similar on them? The content is out there, but don’t underestimate the time and skill required to curate good content. Read more about it from the Content Marketing Institute. The key thing is that all content is planned, scheduled, and monitored against all the topics listed in the calendar above, else it is of no use to anyone. There is a fine line between content being too long to be read, and too short to be useful; and publishing too much content that people lose interest, but publishing enough content that you are seen as an expert, ‘go-to’ person and institution for that subject. There is no right or wrong answer, but there is useful guidance out there. “You’ll probably have more headings, more links, and more pictures, in which the keyword will be mentioned. How often to post can depend greatly on the channel, the topic, the audience and even the time of day. Posting too much on some channels can be annoying and seen as ‘spammy; and posting at certain times of the day could have little or no impact on inbound traffic at all. The only way to really see what really works is to track activities and their value based on the metrics back in the strategy and calendar. And with this additional, incredibly value, content comes the editorial role of quality checking to ensure that the content is on brand, prioritised, useful, informative, audience-focussed and in line with the Content Marketing Strategy else it is just more digital noise. The overall editor should also be responsible for planning everything with the Content Team, training and development and owning the institution style guide. Contentious have done a round-up of the best Style Guides, which is also content marketing itself, as they are Content Strategy and Content Design organisation. It’s all getting a bit Inception! It’s not new news that Content is King and SEO needs content to work, therefore content marketing is the best way to improve your SEO! Your content deserves a crown to make it stand out and shine; and the Content Publishing calendar is that crown (and the Content Strategy its throne – possibly stretching this a bit far now!). Get organised, audit what you have, understand your audiences, train the team, and plan some great content that ensures you stand out from the digital content crowd.